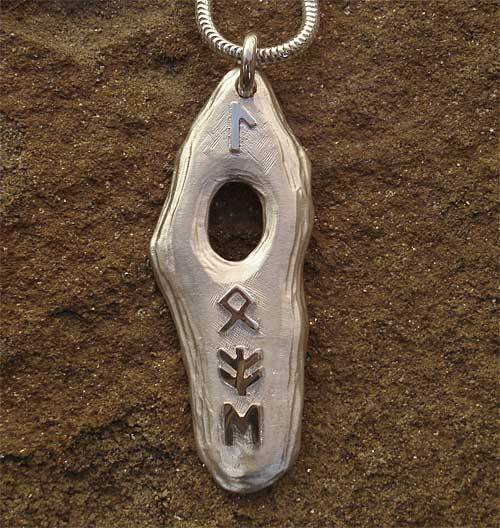 Silver Runic Pendant : LOVE2HAVE in the UK! A silver Runic LOVE pendant on a 16-inch snake chain. 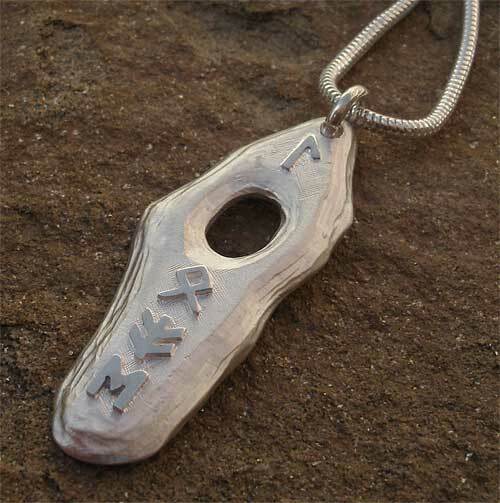 The design of the necklace comes influenced by the Odin Stone. The pendant measures approximately 35mm x 15mm and come's available also on a black leather thong. Our Runes are from the Orkney Runic alphabet or Futhark, evolved in the early centuries AD from Scandinavia and Anglo-Saxon England. Scandinavian Runes spread with the Viking settlers and remains of Runic inscriptions are still to be found in all areas visited by the Vikings through Scotland, Shetland, Orkney, The Western Isles, Iceland and the Isle of Man. There were strong connections between Runes and folklore, and Runic inscriptions are even thought to have divine and protective powers as well.